I was not able to attend, or watch, or listen to the game. Probably a good thing. Bulls fans know that the pitching this year has been awful. The Bulls’ team ERA is the IL’s worst at 4.64. However, if you separate out the starters from the relievers you get a slightly less awful 4.25 for the relievers. That has meant that once the ball gets handed off to the bullpen, the Bulls have a chance. Starter Matt Buschmann handed off a 4-4 tie to his compatriots. They coughed up seven runs. The usually reliable Bryan Augenstein — 2, new guy Frank De Los Santos — 2, and Shane Dyer in his first relief appearance — 3, brutally hot and not pretty at all. See “outside the game” for some future hope in the bullpen. On the interesting stuff side, Tim Beckham started at shortstop, had a double and a home run, reached on an error and scored three runs. So he’s looking pretty good. Reid Brignac went 0-5, every single one was a batted ball going right to the Chiefs first baseman for unassisted outs. Cole Figueroa playing third base made two very slick plays. Rays Index speculated on who will be coming to the Bulls in a couple of days. And they were right, Brandon Gomes and Cesar Ramos will be back in a couple of days. That means at least two current Bulls will need to go, possibly three. Since major leaguers coming down get a couple of days to make the trip, no telling when we will hear. Jim Donten is back in business with his Charlotte Stone Crabs (Rays Single A Team) Claw Digest. A while back we asserted that a .500 season would be a reasonable goal for the 2012 Durham Bulls and we started a chart that showed progress toward that goal. This looks much better than last time. 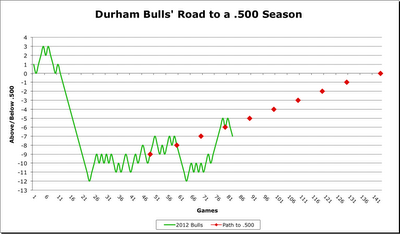 The Bulls did reach the “path”, but then fell off it the last two nights. The Bulls have 61 games left to play and need to win 34 of them to reach the .500 target. That’s .558 baseball over July and August.